This'll probably be my last entry that deals with beef noodles for a long while. I'm sure most people who look at pictures read my blog are pretty sick of the beef and carb heavy content, so that's probably a welcome relief. To be completely honest, I'm kind of sick of it myself. Despite how truly awe-inspiring (yeah I said it) a bowl of really good beef broth and noodles can be, having it all the time can ruin the experience as well. Too much of a good thing I suppose. Anyway, as of this post, consider me officially on hiatus from beef noodles. That said, prior to my self imposed embargo, I did manage to go to one last restaurant I feel justifies a post on its own. 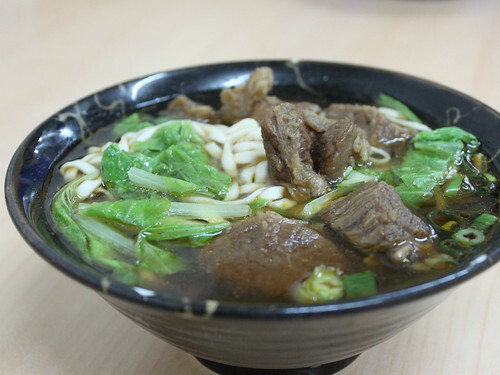 Enter... 濟南牛肉麵 (Ji Nan Beef Noodles). Onto the words that describe the food and whatnot! A small shack located on the street behind my apartment (as expected by the name... 濟南路), barely larger than my dorm room from last year, houses this old mom'n'pop shop started in 1976. The smell of beef is overpowering, and wafts to the end of the block and across the street. Upon walking in, the menu is simple... more or less simplifying to 10 different varieties of beef noodles with varying cuts of beef. For 110 NT (~$3.25) I got the default order, seen above... a small beef noodle soup with thick noodles (the choice is yours whether you want thin or thick). The noodles are clearly not made in house, but they're good enough for the purpose of being satisfying and non-distracting. The beef is fall apart tender, and the broth carries with it all the juices that were present in the meat. The experience after finishing the meal is even more sublime, as you're left with an oddly satisfying thin layer of flavorful oil coating your lips that just... lingers. Despite not doing any one aspect spectacularly (like the noodles at 良品), it does everything adequately. While I don't know if it's one of the best bowls of beef noodles I've ever had, it certainly made me happy at the time. haha, you have to look for the best beef noodle when you are here... even a so-so bowl in taipei will beat out the best bowl in LA, right? I've never been to LA! It's definitely true for NYC. Though some of the better shops there are still really good.